...we are holding special services and events to celebrate throughout the year, beginning on Sunday 17th April with a service led by the Bishop of Manchester. 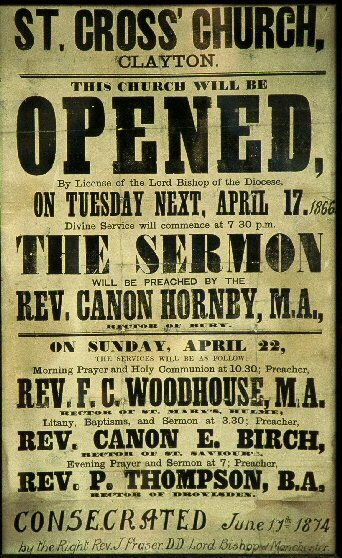 Sunday 17th April, 2pm The Bishop of Manchester, The Rt Revd Dr David S Walker, will be celebrating the first Sunday Eucharist of our 150th Year Celebrations. And at 2pm A lecture by Lord Rowan Williams. Sunday 13th November This year's Remembrance Sunday Service will be at 9:30am, followed by short services with Acts of Remembrance at Clayton Park Cenotaph (10:45am) and at Phillip's Park War Memorial (10:50am). Phillip's Park will also be holding a Service of Commemoration at 11:30am on the 13th November for the 150th Anniversary of the Cemetery. Sunday 20th November A Sung Choral Eucharist to celebrate Christ the King on the last Sunday before Advent. Friday 3rd March This year's Women's World Day of Prayer Service will be held at St. Cross. The focus this year is on the Philippines, with the theme 'Am I Being Unfair To You? '.